Flogging Friday | What's 'normal' anyway? It was Fathers’ Day last weekend. Remember back that far? I barely can, but Fathers’ Day last year is a standout. Not because Mr D was in any way exraordinarily deserving of recognition, although he is pretty good at the daddy thing. No, it was a stand out because I actually managed to make Fathers’ Day all about me. That’s right. I managed to turn the tide and each Fathers’ Day from that point forward has been and shall be forever more, a chance for me to revel in my own past glories. I’m not sure if I won because of the strange role-reversal captured in the scene or because I was somehow able to take photos with our hefty, four-figure, professional-amateur beast of a camera not ten minutes after The Lion finally made it into the world. Either way, becoming an Award Winning Photographer on Fathers’ Day is a trumpet I am happy to blow for many years to come. That’s a real bummer. I’m slowly putting everyone’s links up on my blog page anyway, so the love is still being shared (even if it’s not in a cool numbered list). That’s a great pic! I can see why you won and am in awe of both your ability to make FD all about you – and to take such a cracking pic after birth. Well done on both counts! Oh, what a great photo, capturing such an emotional moment perfectly. Congrats! It is a fantastic idea and I’m turning into an even more neglectful mother with this fab reading list! That photo slays me! 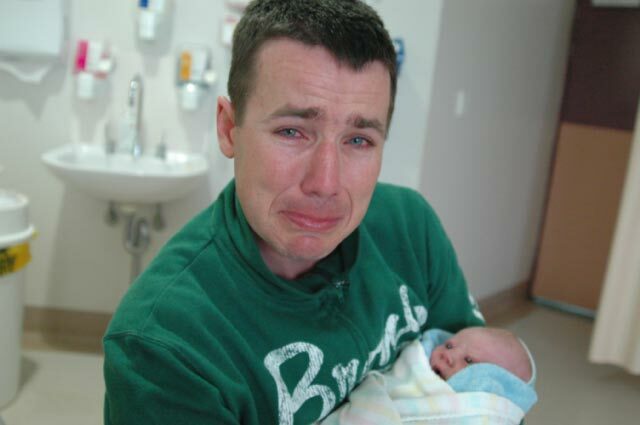 It’s fabulous and captures how new dads the world over must feel perfectly. A worthy winner indeed! Tha’s why he loves me – no shame!